Squash House Quilts: Who was Fuzzy - Winner! Thanks to everyone who played along to guess who Fuzzy was! There were some interesting guesses - bear, hamster, gerbil - lots of rabbits and chicks. Only one person got the right animal!! Congratulations to Annie who correctly guessed that Fuzzy was a baby duck! Here is a photo of Catherine with Fuzzy and Wuzzy on Easter! This is one of the most adorable Easter photos I've ever seen! 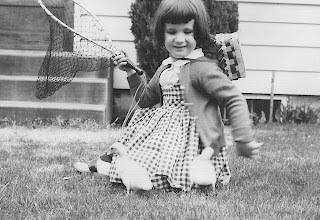 She has her empty Easter Basket around her neck while holding a fishing net, which I suppose was used to corral the baby ducks! The photo was taken outside the back door which is now our lovely patio. Thanks to everyone who played along and also to Catherine for providing some great, vintage photos and wonderful stories! Right now I have my New York Beauty on Vinnie. I hope to have it finished in the next day or two. I've been mostly quilting it freehand except for the border where I used Pounce and a stencil for a quilting motif. I'm beginning to really like working with stencils. Here are a few I got today at our LQS. 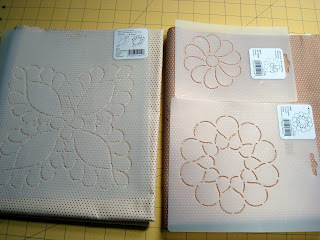 They were having a 20% storewide sale, so I couldn't resist some more stencils and two yards of background fabric! I'm still not terribly confident with freehand feathers, so these 3 stencils should provide some good practice! And I like how they have little printed labels of the designs which have arrows to guide you in the quilting! The other thing I dove into was digital pantographs! I've been buying most of my pantos so far through Digi-Tech. They have an incredible selection of designs for longarmers. Jessica Schick of Digi-Tech has been most helpful in showing me how these digital downloads work! Not only does it save money on shipping costs, but you get your design instantly! Now it's about time I started in on another quilt! Up next will be a Christmas quilt (nothing like plannig ahead) using Fruitcake by Basicgrey and a pattern called Roll On from Pie Plate Patterns. That is a really cute photo. Congratulations to Annie. Looking forward to seeing your NY Beauty finished. 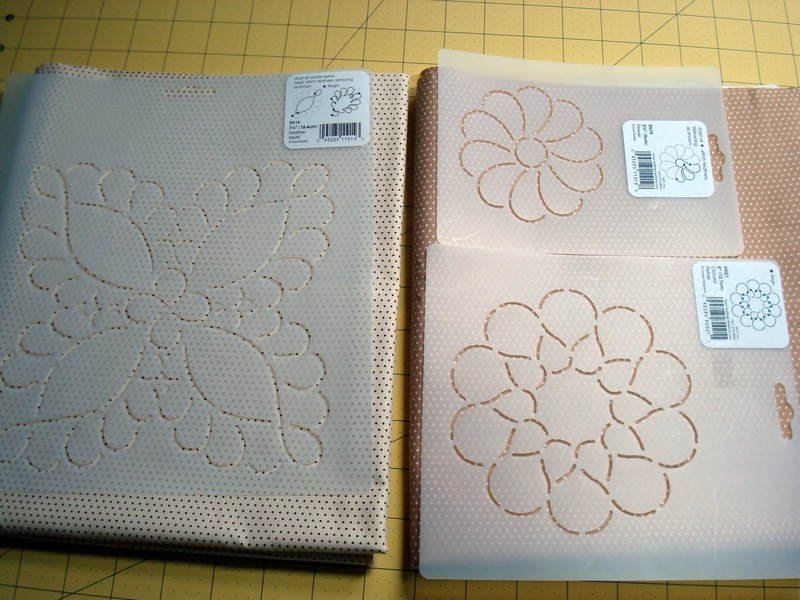 Pretty stencils. Congrats to the winner...fun game, thanks!! Sweet picture. Congratulations to Annie! When I was little we used to feed a summer neighbours ducks when they came swimming across the bay, and of course there were the wild baby mallards to feed too. A very adorable photo! I would not have noticed she had the basket around her neck if you hadn't pointed that out! Fuzzy and Wuzzy were very cute. Thanks for having the giveaway--I am so excited to win Stephanie's pattern and the beautiful fabric to make the bag!!! Congrats on progress with your long arm quilting--I have never used pounce but have often wondered about it. Oh my, that is such a really cute photo. Love it. Fun game and I love the old photo. Hope more show up! And I was sure Fuzzy Wuzzy was a bear! How fun. Can't wait to see your quilting, and yes, stencils are great. I always say they "keep me honest" What I mean by that is that I get all the same size of motif, they may wobble a bit here and there, but it's consistancy that is key. Glad you are having fun with Vinnie. Love the photo and story! Umm, I was pretty far off in my guess of a bear!! LOL! Annie is a genius! Can't wait to see your progress on Vinnie!! I know it'll be gorgeous! I really like the stencil you picked up too! I'm anxious to see the collaboration between Vinnie & New York Beauty. It's sure to be stunning.